#Badgers Hayes might be one of best/most versatile defenders in the nation. Wisconsin w/o a bucket for 5:50. Rutgers w/o a bucket for the last 4:04. Badgers somehow lead 18-17 with 4:46 left. UW 5-for-20 from the floor and 1-for-9 from 3-point range. UW has scored only 6 points off 10 Rutgers turnovers. Gard to Gene Steratore: "There's more blocking here than there is at Lambeau Field on Sunday." Badgers now 1-10 on threes. 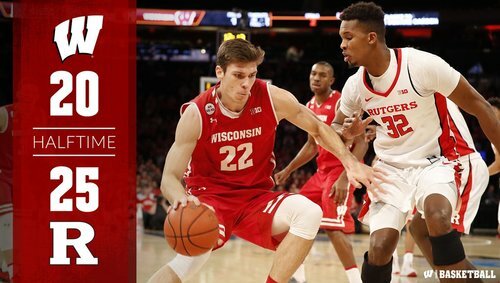 #Badgers trail 20-18 with 3:29 left until halftime. UW 5 of 21 from the field, 1 of 10 from 3-point range. #Badgers now a sizzling 1-10 from 3 and 5-21 overall. Rutgers leads, 20-18 with 3:29 left. UW has missed its last eight shots from the field. Most recent made FG was by Showalter at the 10:36 mark. Tough stretch for the #Badgers , who have missed their last 8 shots. 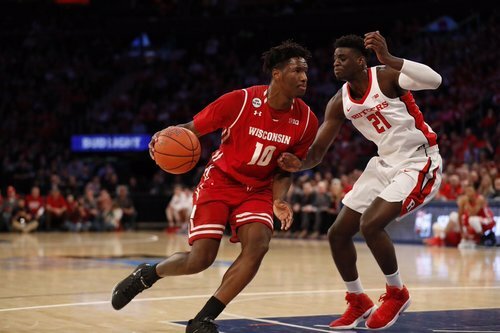 Nigel Hayes with 2pts, 3reb, 1ast and 1blk. Rutgers is on an 8-0 run and has opened up a 25-18 lead. Timeout, Gard with 2:33 left until halftime. So Rutgers hits a three and then gets a steal/dunk for a 25-18 lead with 2:33 left. #Badgers Gard takes time. Rutgers now on an 8-0 run and lead 25-18 with 2:33 left. Gard calls a timeout to try to wake up his squad. Steal and SLAM from ISSA THIAM! Seven turnovers in 28 possessions for the #Badgers . Pritzl in. Bronson Koenig now 0-for-5 from the floor, including 0-for-4 from 3-point range. UW 1-for-11 from 3. RU contingent starting to get loud. Ten fouls on RU in the half. UW shooting 75% from the line. Shoot to get hot, shoot to stay hot. #Badgers 0 for last 11...No FGs in last 10:14. RU not a good FT shooting team. Shooting <60% in B1G play. HALFTIME: #RHoops leads No. 15 Wisconsin 25-20! Shocked Pritzl didn't take that 3. Halftime: Rutgers 25, #Badgers 20. UW 5 of 25 overall, 1 of 12 from 3-point range. Badgers haven't hit a FG in 10:36 mins. Koenig, Brown and Hayes combine to go 0-for-12 from the field in the first half. So, that was...interesting. Feels like the Pitt tournament game in STL last year. PPP: Rutgers 0.76, #Badgers 0.61. 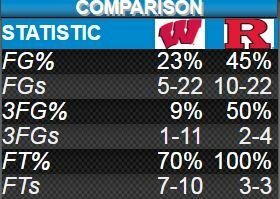 UW had no field goals, five points over final 10:36 (17 possessions). UW crowd is the collective physical embodiment of uncomfortable murmuring. RU is TERRIBLE offensively. If the Badgers start dropping shots, this one may turn quickly. Happ is 3 of 5 from the field and has 11 points. Rest of team: 2 of 20, nine points. Koenig is 0 of 6 overall, 0 of 5 from 3-point range. The first half score sheet is a barren wasteland of zeroes. Koenig 0-6 (0-5 on 3s); Brown 0-4. Team is 1-12 from three. Rutgers has 14 points in paint. #Badgers have 8. Expect to see UW attack inside immediately here.